The Community Folk Art Center (CFAC), located at 805 E. Genesee St., is set to get a signature facelift Thursday, Aug. 18, and Friday, Aug. 19. 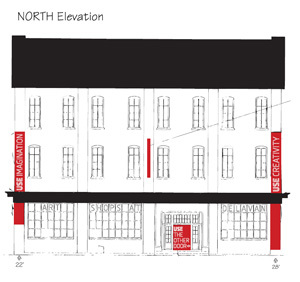 Once completed, CFAC will be the first building on the Connective Corridor to showcase new signage branding the district. The project is funded by the Façade Improvement Program (FIP) through Empire State Development Corp. Eligible residents, businesses and organizations can apply for up to $25,000 in capital improvement funding, which can include projects such as upgrading windows, lighting, landscaping, painting, creative signage, outdoor furnishings and other items. Applicants must implement at least one of the three design elements: the “USE” identity (signifying the last three letters in “SyracUSE”), red color scheme or Ohm font. Currently, 22 applicants have been conditionally approved for $361,500 of FIP funding since the program began in February. An additional $263,500 remains available for future eligible applicants. The Onondaga Historical Association, the first FIP applicant to receive final approval, used $25,000 to help restore windows that had been bricked up for years. In a few weeks, additional façade improvements will be made at the Delavan Art Gallery, located at 501 W. Fayette St., as branding projects continue marking the route. Any property located directly on the Corridor is eligible for FIP funding, including residential properties, commercial properties, for-profit organizations and nonprofit organizations. Design criteria and application information can be found at http://connectivecorridor.syr.edu/resources. For more information, contact Michael Short at (315) 443-5402 or mwshort@syr.edu.